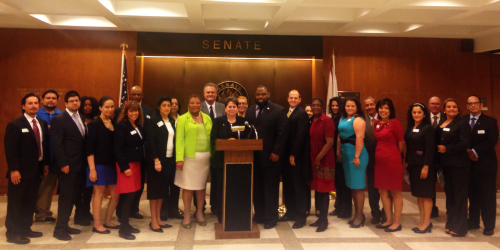 On Wednesday, the Democratic Hispanic Caucus of Florida (DHCF) held their second annual lobby days, expressing their values and making their voices heard. Over 30 Hispanic Caucus members attended the lobby days this year, and successfully lobbied to ensure the Florida legislature’s consideration of drivers’ license for DREAMers. Caucus members also worked with members on employment discrimination, state minimum wage, and many other bills that will lead to a positive change for the Hispanic community. Vivian Rodriguez, President of the Hispanic Caucus said, "We lobbied and made our voices heard on behalf of the countless Hispanic voices that need to be heard in Tallahassee." Advocating side by side the caucus members were State Senators Darren Soto, Geraldine Thompson, and Dwight Bullard, and State Representatives Jose Javier Rodriguez, John Cortes, and Hazel Rogers.